Welcome to the Events Direct Facility. We’ve worked hard to build a business that has everything you need for Eventgistics: storage, security, organization, and the right team to run it all. We’d love to meet you personally, but if you don’t have time to make it to our Midwest location, take a virtual tour. We’ve got tons of space: 125,000 square feet, to be exact. It’s climate controlled with plenty of room for storing your inventory, fulfilling your orders, and setting up all the elements you need for your next event. You can rest easy knowing your inventory is secured with our video monitoring system. Take a look at what we offer, then give us a call to find out more. 125,000 square feet of warehouse space. We have all the space you need to warehouse, inventory, fulfill and even set up your event elements. 16 dock doors for unloading and loading of trucks. No matter how many trucks you have we can load and unload all of them at one time. We have a ramp for those times when you need to bring items into the warehouse that won’t back into our docks. Security cage for all electronics requiring caged storage. Our entire warehouse is secure and monitored with video cameras, but we also offer a security cage where the most valuable of electronics can stay tucked away from your other elements. Security cameras throughout the facility. Every foot of our warehouse from the inside to the outside is monitored with video cameras. Your stuff is being watched at all times so that everything is always safe. Shipping from anywhere in the US to anywhere in the US. We specialize in shipping the event marketing elements from anywhere to anywhere. We understand that you must have your items on time, every time without fail. Shipping items from a location with NO address to a location with NO address anytime, day or night. Ever needed your event elements picked up in Central Park on a Sunday night at 2am? Or delivered to a beach on a Friday night at 11pm? 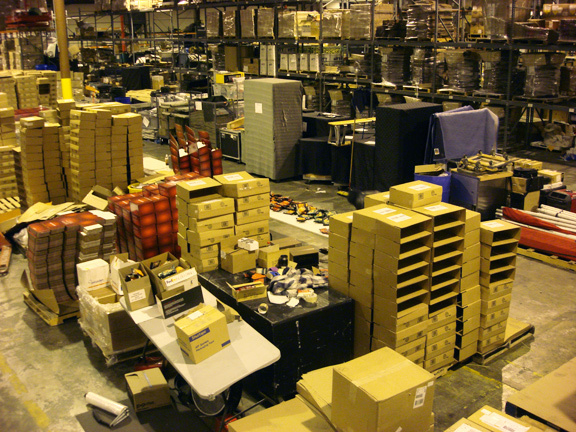 Or have you ever needed a pallet of event equipment to be delivered to 100 malls all on the same day at the same time? We specialize in these types of shipments. We can get your stuff to you anywhere at any time. Online Inventory Management. Have you ever woken up in a panic over how many t shirts you had in inventory before that big event, or if you were going to have enough barware for your next gala bar event? With our online inventory management system you won’t have to lose sleep any longer. You can access the online inventory system 24/7 to see photos and how many of every item you have in stock.